The city of Zagoravia is cursed. Horrors of the night prowl Victorian-esque streets, whilst monsters infest the labyrinthine guts of the city. You play Victor Vran, a dour hero and demon-hunter, recognisably voiced by Doug Cockle (Geralt of Rivia). Whilst a competent and often exciting action RPG, it’s hard not to feel as though the Gothic aesthetic has been wasted. The shallow narrative has a few similarities with Bloodborne and its city Yharnam. Unfortunately, whereas Bloodborne meshes dark, psychological, and often transgressive themes with thoughtful, logical mechanics, Victor Vran is comparably witless, even careless, in its approach to its theme and setting. The Gothic in Victor Vran is a thin, icon-driven veneer thrown over all-too discernible action RPG mechanics. Icon-wise, it makes a go of its horror setting. 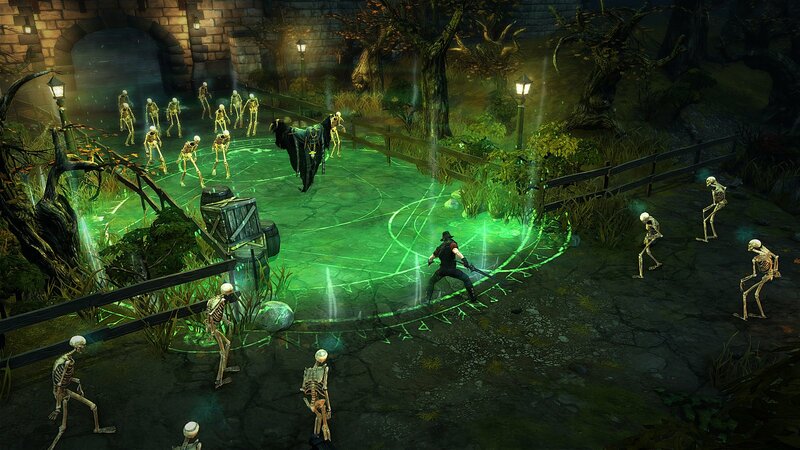 You’ll be hacking your way through an assortment of spiders, vampires, ghosts, and reanimated corpses, but Victor Vran never attempts to reach beyond the core cycle of hitting things and looting treasure. The game consists of a number of zones with the option of exploration—a royal garden, a forest, and several city sections. Off of these branch half a dozen or so smaller dungeon levels, each with their own internal challenges (think Achievements/Trophies). Released back in 2012, Blizzard’s Diablo 3 marked an attempt to offer a more stripped-down, arcade-style action RPG experience. Whilst Blizzard have done much to reverse and rescind those original design decisions (to the relief of core fans), its launch earlier in the decade is still significant. Victor Vran has followed many of those original Blizzard tenants, such as making the combat feel more immediate and responsive, as well as simplifying and clarifying the choices available to players in regards to character development. There are no classes in Victor Vran, only rough play styles and several weapons. Each weapon is unique in its animation and effect. Poking foes with the rapier feels very different from slashing at swathes of enemies with the sword. Each weapon has three abilities which work in conjunction. The scythe, for example, builds up charges with its base attack and then dispenses these for a longer stunning effect. The ranged shotgun recharges your abilities for every single-hit kill you achieve, pushing you towards more intelligent targeting, whilst the lightning gun gives you the intricate buzz of firing off orbs of charged electricity and then combining them with devastating effect. With only a few buttons to press, Victor Vran’s simple-but-satisfying combat is easily mapped to a control pad. The default keyboard-and-mouse controls use a WASD scheme, as opposed to more traditional mouse-based navigation (although the option is available). Alongside the ability to jump, wall-jump, and even dodge-roll, there’s a real emphasis on fast-paced action, to the detriment of character development. There is, of course, loot in the game, although it’s mostly focussed around weapon upgrades and Destiny Cards. These equippable cards help you hone in on a particular play style. Some cards will boost your health and defence, add life stealing or critical hit chances, or trigger magical spells. Finally, there is your Demon Power, a particular spell which you can customise and use when your overcharge meter fills. Victor Vran has a fair few things going for it. Each of the weapons are satisfying to learn and use, so even if you’re killing spiders and skeletons over and over again, there’s novelty built on top of the immediacy of each button press/click. It’s an enjoyable romp, even if the Gothic trappings never amount to much (it’s not even pulp horror quality, and it’s completely spoiled by spots of dreadful Stanley Parable style meta-textual commentary). With the option of online co-op, plenty of side dungeons and crypts that aren’t necessary to the main story, and hard-mode challenges for the completionists, there’s more to the game than you might expect for something so small budget. Victor Vran is more naturally comparable to Baldur’s Gate: Dark Alliance than Diablo. There’s very little role-playing and the plot isn’t really worth speaking on, but it’s a game confident in its combat and enjoyable even after repeated hack and slashing. The Gothic in Victor Vran is a thin, icon-driven veneer thrown over all-too discernible action RPG mechanics. Icon-wise, it makes a go of its horror setting.